Cod catches overall will have to be cut by 25 per cent in 2012 – but many other fish quotas are raised after late-night EU negotiations. 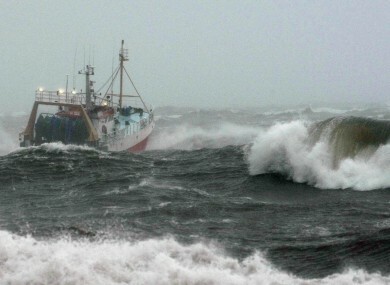 THE MINISTER FOR Agriculture, Food and the Marine, Simon Coveney, has said that the fishing industry in Ireland can look forward to 2012 with “optimism”. He was speaking this morning after negotiations with EU fisheries officials – a new deal for Ireland’s fisheries was brokered in the early hours of this morning. Three days of negotiations ended with the announcement that the Irish Sea prawn fishery would be reopened immediately. This, said Coveney, was a “very significant hard-won achievement”. The fishery had been closed in mid-October and had been due to stay closed until at least 1 February 2012. It is estimated that it will be worth €52m to the Irish economy in 2012. The quotas of prawns to be caught in the Irish Sea and off the south and south-west coasts will also be maintained under the agreement. The Irish quota for haddock and whiting to increase by 25 per cent and 15 per cent respectively. Coveney said that the EU fishing commission had originally wanted to cut haddock and whiting quotas for the Irish fishing industry by 25 per cent. The increases are estimated to be worth an extra €3.5m to the south coast fishing industry. The haddock quota will take a massive jump in one particular area, off the coast of Donegal, where it will increase by 200 per cent. New rules to facilitate this quota will be brought forward by the middle of February. There will be a 155 per cent increase in the quota for Boarfish fishery off the southwest coast – the amount that can be caught will go from 22,227 tonnes to 56,666 tonnes. This is a relatively new fishery and Coveney thinks its potential is “exciting”. The Albocore Tuna fishery off the southwest coast has been increased by 9.6 per cent to 3,896 tonnes for 2012. The Blue Whiting quota off the northwest coast has been increased six times over from 1,187 tonnes this year to 7,498 tonnes next year. Email “Irish Sea prawn fishery reopens - and other fish quotas increase”. Feedback on “Irish Sea prawn fishery reopens - and other fish quotas increase”.